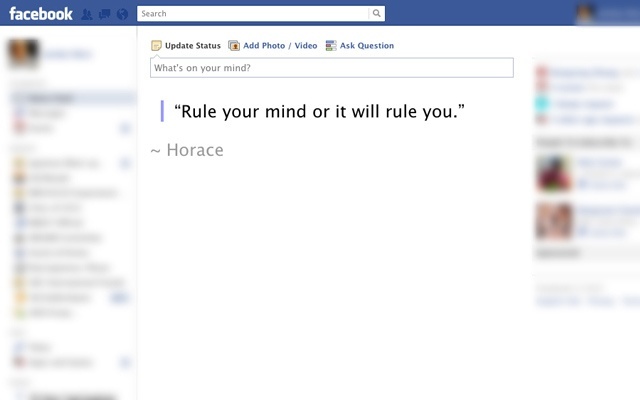 Removing Facebook Distractions - Eat. Move. Hack. Facebook can be a time drain & also depressing at times. Typically users choose only to post that which is “good” or interesting; neglecting that which isn’t. So while you’re peeking into other peoples lives and getting depressed at your own you’re not living your life. However this aside it is a great medium for communication and very hard to get away from. In a certain sense not having a Facebook account could socially isolate you. A great compromise is to block the news feed and news ticker from showing. This means that each time you load Facebook you’re not presented with content that could be of interest. Why is this beneficial? It allows you to stay in the social network loop, maintain your relationships whilst not having everyone else’s lives thrust upon you. Arguably you could do something similar through discipline or individually unsubscribing to friends en mass.